It became easier to become a half door after wearing but the sound when the door was closed is van! From Bonn! A little luxury car got quiet. This review is about item#34913374. I was worried about the airtightness of the door of the car, but if it is cold the adhesion surface is bad and we will wait until next spring. I raised the airtightness around the door of the car and stuck around the door in order not to put the noise from the outside into the car. 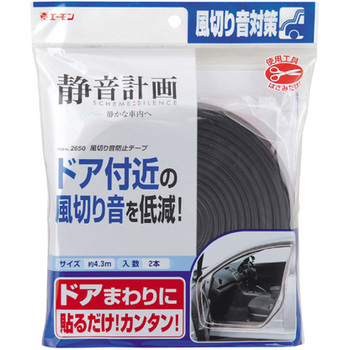 This product is also highly waterproof, sticky to the adhesive tape is strong, very good workability is also very good It is a recommended item. I also wore it to the lighthouses, the front door and the rear door, and also to the rear hatches. There was considerable effect. The interior of the car became quiet as soon as we can see it as clear.